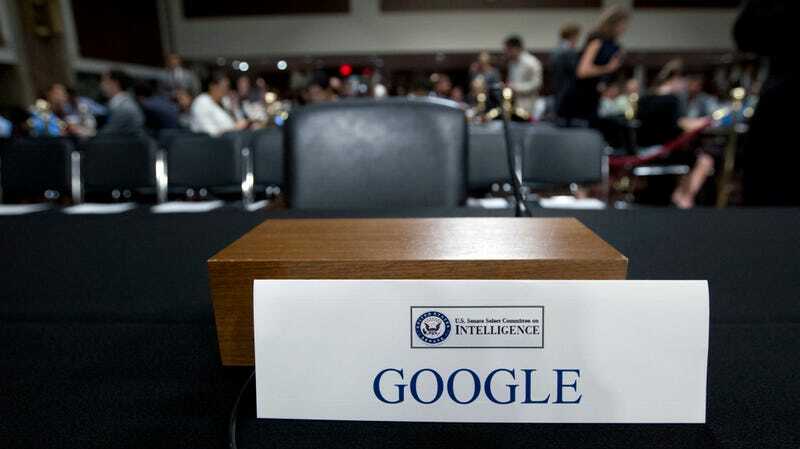 An empty chair reserved for a top executive for Google’s parent company Alphabet amid a September hearing on the Senate Intelligence Committee on “Foreign Influence Operations and Their Use of Social Media Platforms,” which Alphabet declined to send a top executive to attend. Google has dropped out of the competition for a Pentagon cloud computing project that could be worth as much as $10 billion and last up to a decade, citing a possible clash with its corporate values, Bloomberg reported on Monday. Google’s announcement on Monday came just months after the company decided not to renew its contract with a Pentagon artificial intelligence program, after extensive protests from employees of the internet giant about working with the military. The company then released a set of principles designed to evaluate what kind of artificial intelligence projects it would pursue. The decision to back out of Project Maven occurred after thousands of employees signed a petition asking the company to stop working with the military, with numerous employees resigning in protest. Sources told Gizmodo that Google Cloud CEO Diane Greene had characterized the issue as a major headache for management. Though Maven itself was of limited value to the company, senior Google executives allegedly viewed it as a gateway to lucrative defense contracts involving projects like as surveillance systems that could monitor entire cities. The Defense Department’s cloud needs are directly related to its ambitions for highly networked warfare across air, sea, land, space and cyberspace. That cloud provider will be helping the military hit targets and execute missions better, and much, much faster, even if the cloud is not formally involved in target selection or engagement, a job that the Pentagon maintains will continue to be done by human troops for the foreseeable future. The front-runner for the contract is widely believed to be Amazon, which already has a $600 million contract with the CIA. As the Washington Post wrote, Amazon is also one of the only major companies that supported a single, winner-take-all approach to the bidding process, which competitors have complained could essentially give it a monopoly on cloud computing contracts for the military in the future.